Enjoy that view of the outdoors year round. With the space being climate controlled, you can enjoy the space in the middle of the winter or the middle of the summer. And for those days when the weather is beautiful, open all of the windows and feel the breeze passing through. To match your taste, we offer every different styles from Rustic to Contemporary. The sunroom, just like an addition can be tied into the house with matching siding and roofing making it look like a part of the home. With an extensive background in the deck industry, we offer you the best options to fit your specific situation. We pay special attention to how the deck will function for you and your intended use while keeping in mind things like traffic patterns, safety, and layout. From efficient to elaborate, we will design and build you the perfect deck that will last for many years to come. Currently there are an enormous amount of products and materials on the market for decks. We only work with those that have a proven track record and come from a reputable company. Your project should not be the test track for new products. Beauty can only be maintained with strength and durability. 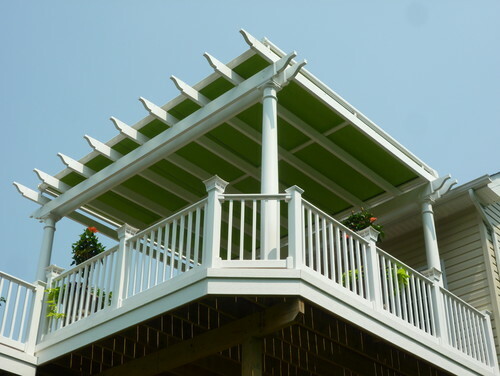 Screened Porches are the best way to add living and entertaining space to your home and allow you an outdoor retreat to enjoy company or a quiet evening relaxing away from insects and unwelcome weather. 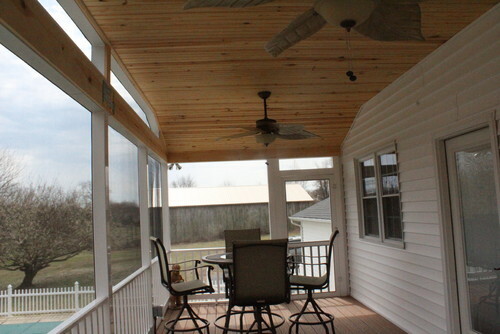 We construct the porches in a way that they can be converted into sunrooms easily and go from 3 season use to 4 season use. Add character and curb appeal to your yard with a patio and professional landscaping. Award winning landscaping designs and patios are ready to make your yard the retreat you deserve. Patios and retaining walls add natural square footage to your outdoor living space with the most durable materials. Natural or manufactured products will give you a lifetime of comfort. Energy efficiency is one of the most valuable exterior remodeling improvements you can add to your home. The quality of your doors and windows are important, but more importantly is how they are installed. We guarantee that your windows and doors will be installed properly and making sure that they are sealed from air and moisture. Replacement of the roofing and siding on your house will give you more than just better curb appeal, it will also improve your energy efficiency and prevent water damage to your structure. We have seen countless homes over our years of work that have sustained major structural damage that was caused by improper installation techniques. A simple $2 piece of flashing installed incorrectly can cause thousands of dollars in damage. If you are questioning the protection that your roofing and siding are giving you, then give us a call and at the very least, get an honest professional opinion to feel safe. With so many waterfront properties in our area, it is extremely important to use the proper materials correctly. Improper installation will void your warranty and make your home vulnerable to high wind and water damage. We specialize in high strength quality products like Hardie Siding, Certainteed, GAF, and natural wood.